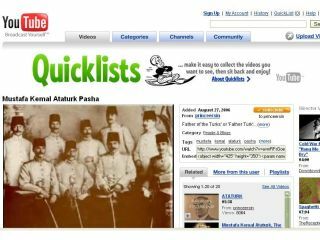 A Turkish court has placed a ban on popular video sharing site YouTube , after a video was posted insulting revered Turkish statesman Mustafa Kemal Ataturk. The court ordered Turk Telecom to block the site until the video has been removed; the block will be lifted once the court gives permission. Paul Doany, head of Turk Telecom, told The Register : "We are not in the position of saying that what YouTube did was an insult; that it was right or wrong. A court decision was proposed to us, and we are doing what that court decision says." YouTube has seen a number of videos posted by Turkish and Greek people aimed at insulting each other. Insulting Mustafa Kemal Ataturk in Turkey can lead to imprisonment. This is the latest censoring of the website, which is dominated by user-generated content. In January, Brazilian ISPs banned YouTube after its courts demanded YouTube remove a secretly-shot video of Brazilian model Daniela Cicarelli. In France, user-generated content can now no longer include violent acts. The country this week passed a law decreeing only professional journalists can film violent acts. Leading French political analysts have mentioned that the law could inhibit citizen journalism, or members of the public filming violent acts as evidence.